Buy two (2) H-E-B PassioNut Bars, 1.4 oz., assorted varieties get 3rd FREE! Natural flavor. Gluten free. Good source of fiber. Contains 15 g of fat per serving. 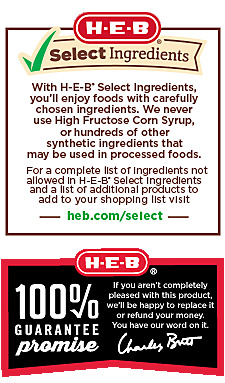 H-E-B Select Ingredients products are made with carefully selected ingredients and without hundreds of synthetic ingredients. For more information visit heb.com/select. Ingredients Peanuts, Dark Chocolate Flavored Coating (Sugar, Palm Kernel Oil, Cocoa Powder, Whole Milk Powder, Soy Lecithin [Emulsifier], Salt), Almonds, Honey, Rice Syrup, Rice Flour, Peanut Butter (Peanuts), Chicory Root Extract, Sugar, Soy Lecithin (Emulsifier), Calcium Carbonate, Salt. Contains: peanuts, milk, soy, almonds. Manufactured in a facility that processes other tree nuts.